John Pfeiffer '88 runs his own successful online marketing services agency today and looks back on the opportunities and sense of individualism that Lambda Chi Alpha, Gamma Psi chapter, at Lehigh University fostered in him and his brothers. "I think what initially attracted me to Lambda Chi is a natural disdain for authority," John laughed. "Within the traditional fraternity structure between pledges and upperclassmen, the pledges have to go through huge ordeals, often six months to a year of often pointless drudgery to earn the privilege of being a brother. At Lambda Chi, they have an Associate Member Program which is more of a graduated structure with less steep differentials of power between underclassmen and upperclassmen. Though still based on seniority, everyone has more of a say with fair input from underclassman. Once you become a brother, you find that everyone has duties and they all share the work fairly. In short, Lambda Chi lived up to the idea that you should treat your brothers like actual brothers." In addition to Lambda Chi's unique approach, John felt a kinship with the brothers he met from the fraternity. "There was greater diversity among the brothers and a stronger sense of individualism," John said. John was active in the fraternity and had the opportunity to take on a number of leadership roles toward improving the house and serving the community. John lived in the house for three years and during that time he captained a number of house athletic teams, served as house manager and oversaw elements of house maintenance, and even took charge for a time of the Gamma Psi ritual of initiation. "Working with the initiation ceremony appealed to me because it has so much theatricality," John said. "Elements of the ritual have been handed down from generation to generation, but there is a sense of a right of passage that appealed to my artistic streak. " These experiences had important life lessons for John, helping teach him to manage people's time and work with a range of personalities, while building great friendships. "I distinctly remember the camaraderie in the house,' John said. "For us it was a stable and constant influence even as everything else around us was changing. After all, in college you spend most of your time not in class. So, you're likely to spend 50% to 75% of your time at the house – hanging out with the guys, studying, it all involved Lambda Chi." Lambda Chi provided gave not only a sense of stability but a better balance in his own life and ultimately left him more poised for success. "Lambda Chi provided a work/life balance for me," John said. "If you just stuck to the books the whole time your college experience wouldn't be as fulfilling. Lambda Chi was a source of stress relief, fun, entertainment and brotherhood you just wouldn't find living in a dorm or in an apartment." John commented that although the brothers weren't focused just on academic success, it was nice to "have everyone pulling the rope in the same direction" with the brothers similarly focused on getting good grades or finding jobs. John found his own success since graduating from Lehigh. He achieved his masters degree in Finance and after working for a time for advertising agencies on Madison Ave. in NYC and in San Francisco, he moved with his family to Boulder, Colo. where he founded his own agency. 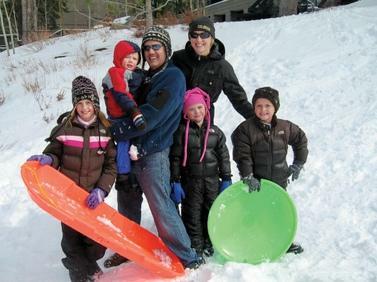 "We had always talked about moving to Boulder as we thought it would be a great place to raise kids. It has a simpler way of life, lower cost of living; we loved San Francisco and may move back some day but it's difficult to have kids there. I needed a new venture in Boulder, this was around the economic downturn, and I noticed there were lots of mid-sized and small companies in that area, so I founded an agency that can serve them with search engine optimization and social media marketing." John feels that the experience he gained working with a range of people and developing leadership skills have helped him in his entrepreneurial venture, to say nothing of his marketing degree from Lehigh, but wishes to remind active brothers that the Lambda Chi experience has many different kinds of benefits. "You're developing life-long friendships in Lambda Chi," John said. "Enjoy your time there but don't take those relationships for granted. I can't make it back to the East Coast as often as I would like, but I have memories that will last a lifetime." John isn't able to make it back to Bethlehem for the golf outings and Lehigh v. Lafayette games as he did before moving to the West Coast, but he has found a number of brothers on Facebook and has enjoyed reconnecting online. Reconnect with John at [email protected].